We now have a new, unexpected corollary to American Library Association (ALA) Strategy Guide Jenny Levine’s belief that ALA conference hallways provide an extensive network of informal learning venues: those hallways extend much farther into our blended onsite-online world than any of us could have imagined—and create amazing intersections. While most ALA 2014 Midwinter meeting attendees were leaving Philadelphia Monday and Tuesday to return home last week, I remained in town an extra couple of days to relax, to explore the city and its wonderful museums, and to continue conversations and other informal learning opportunities with colleagues who were still there. Georgia Public Library Service Director of Continuing Education and Training Jay Turner and I, for example, had an unplanned dinner, followed by an additional meal together the following day when it became apparent that the severe storm disrupting all forms of travel in Atlanta was going to force him to remain onsite in Philadelphia far longer than he anticipated. We took advantage of that opportunity to continue learning from each other about some of the tech trends in libraries and library learning endeavors we have both been exploring and, in that way, extended the conference hallways far beyond the walls of the Pennsylvania Convention Center. In between those shared meals, I carved out time to visit libraries on the Temple University and University of Pennsylvania campuses—and had no idea that the ALA hallways were about to intersect with the hallways created and nurtured by colleagues in the New Media Consortium (NMC) one year earlier. The visit to the University of Pennsylvania begins with a return to one of the most lovely libraries and library reading rooms I’ve ever seen: the Anne & Jerome Fisher Fine Arts Library. The reading room is the sort of space where you ache to find something to read just so you can read it in that space—and if you love art, it’s not at all difficult to find something to meet that need. Leaving the Fisher, I decide to cross the quad for a brief visit to the Van Pelt Library. And that’s when the ALA Midwinter meeting hallways and the NMC hallways expand and collide in the most unexpected and wonderful way—transcending time and space. Attending the NMC 2013 Summit on “The Future of Education” in Austin, Texas exactly one year ago—immediately before flying from Austin to Seattle to attend part of the 2013 ALA Midwinter meeting—I had met an NMC colleague (Anu Vedantham) who serves as director of the David B. Weigle Information Commons. Dinner with Anu and a few other NMC colleagues in January 2013 was a spectacular experience for me for many reasons: I had loved the Weigle Information Commons from a distance ever since I had come across a playfully clever introductory video prepared by Weigle students using Weigle resources; sitting with Anu and other colleagues in Austin a year ago gave me a chance to hear first-hand about how the Commons had developed since the video was produced; and the conversation unexpectedly continued a few days later in Seattle when one of our dinner partners unexpectedly showed up on the ALA Midwinter exhibits floor at the same time I was browsing the exhibits—and, furthermore, turned out to be sharing a room with a colleague with whom I was serving on an ALA committee. And now, I’m experiencing that NMC-to-ALA process in reverse, for as I enter the Van Pelt Library, I turn to my left on the first floor of the building and see a large sign marking the entrance to Weigle—which I had completely forgotten was on the University of Pennsylvania campus. I approach a person sitting at the Commons reception desk and ask if she can “help me find a colleague who works here” (because, of course, I had also forgotten that Anu is director of the Commons). Less than a minute later, Anu is giving me a fabulous whirlwind tour of the Commons in the 15 minutes she has available before her next meeting. 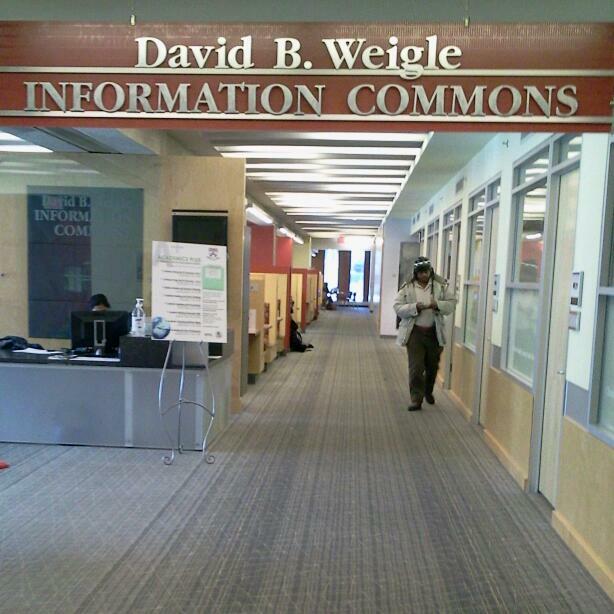 Anyone interested in training-teaching-learning and the intersection of technology, learning, and libraries needs to see the Weigle Information Commons. It doesn’t matter how you see it. In person. Online. Through blog pieces like this one. Or through videos. What is important is that you become aware of what it means to contemporary training-teaching-learning endeavors. The spaces are lovely, flexible (furniture can easily be rearranged to accommodate various learners’ needs), well lit, and inviting. 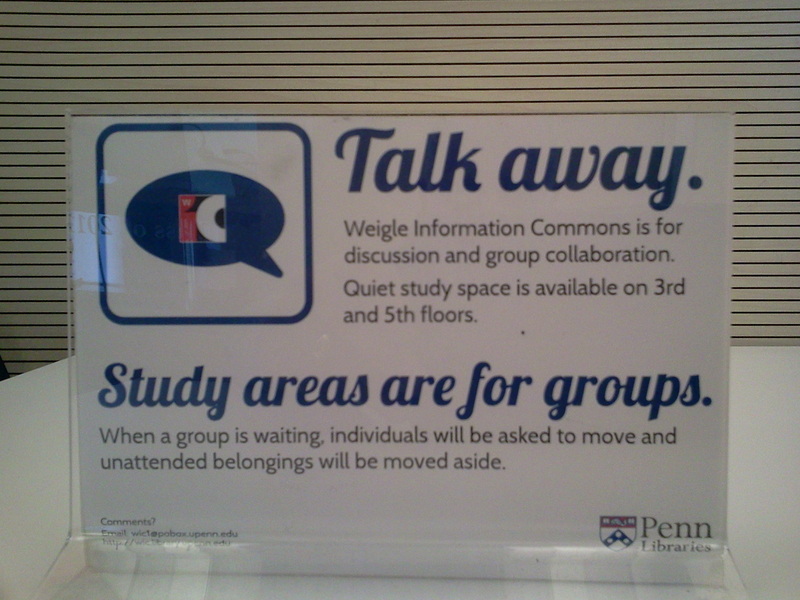 Data diner booths, for example, include prominently-displayed cards encouraging learners to “Talk away” and reminding them that “Weigle Information Commons is for discussion and group collaboration”—key elements in many successful learning experiences. Walking past a variety of group study rooms designed to facilitate conversations onsite as well as online (through Skype), we arrive at the original Vitale Digital Media Lab—another sign that those ALA Midwinter conference hallways are reaching beyond the spaces within the Pennsylvania Convention Center, for I see a physical manifestation of the sort of tech learning and lending library that former ALA President Barbara Ford described to me a few days ago (at the Midwinter conference) when she was discussing the roles libraries can play in helping learners explore new technology. Staff and student interns are there in the Digital Media Lab to work with their peers. And for those of us involved in workplace learning and performance (staff training) endeavors in a variety of settings, there is yet another opportunity to be pursued: students who in the course of learning to help other learners explore new technology could easily be part of the talent pool from which we will draw new trainer-teacher-learners as they enter our workplaces in the next few years if we welcome them into learning organizations such as ALA and ASTD (the American Society for Training & Development) to provide them with a gateway to our profession. The tour doesn’t end there. With my usual luck, I have arrived just in time to attend a launch party marking the opening of an extension of the Digital Media Lab: “Vitale II,” a wonderful space that operates as a smart classroom/collaborative meeting room, on the sixth floor of the Van Pelt Library, to support digital research in the Kislak Center for Special Collections, Rare Books, and Manuscripts. Vitale II has a moveable conference table and chairs in the center of the room; a high-resolution camera in the ceiling so that what is being demonstrated on the table can be projected onto a large screen in the room and also transmitted to offsite colleagues who want to participate in whatever is happening in the lab; and a white board listing upcoming formal and informal learning opportunities, Curator of Digital Research Services Dot Porter shows me as Anu leaves for her next appointment. To say that I’m inspired and overwhelmed by all I’m trying to absorb during this 30-minute visit doesn’t even begin to capture all that Weigle, its labs, and its staff and students suggest in terms of where we are going in training-teaching-learning. I want to be working and learning in one of those spaces. Now. But knowing that my time in Weigle and the two Vitales is limited, I play one of my favorite games with a staff member: I ask her to blurt out whatever words come to mind as she thinks about what Weigle offers so I can see the Commons through the eyes of someone very familiar with it. She confirms what I expect: Collaboration. Learning. Technology. Playfulness. Whimsy. And then she captures what she loves about what Anu fosters throughout the extended Commons: “She has toys”—and she makes them available. It’s clear that our opportunities to learn from each other in this sort of creative, playfully collaborative setting are steadily increasing. And it remains in our hands to reach across the onsite and online hallways we all traverse to see where these opportunities will take us—and those we serve—in the days, weeks, months, and years ahead of us. 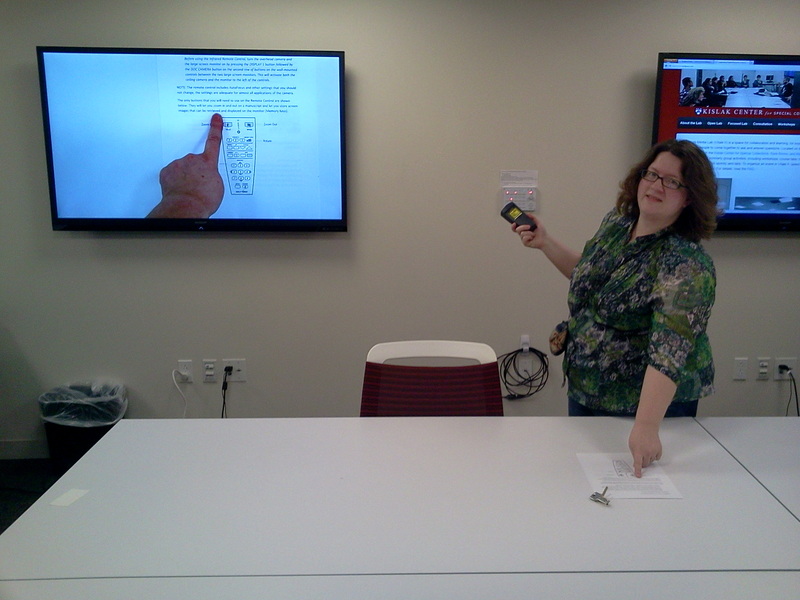 This entry was posted on Monday, February 3rd, 2014 at 2:32 pm and is filed under libraries, technology, training. You can follow any responses to this entry through the RSS 2.0 feed. You can leave a response, or trackback from your own site.